The Launch Pad: SpaceUp San Diego, Tomorrow! 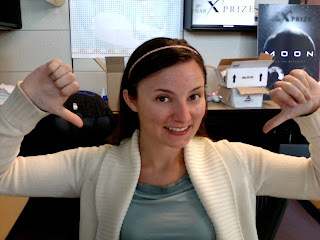 Who has two thumbs and is stoked about SpaceUp this weekend? This weekend, Will, Rovey, and I are attending SpaceUp in San Diego -- a barcamp for space exploration, where structure and schedule are decided in real-time by the event attendees. The format is refreshingly unique as content is driven by the event participants, with information and ideas captured via wiki for everyone to digest online. Attendees at the unconference will include representatives from NASA, Masten Space Systems, Unreasonable Rocket, The Aerospace Corporation, and many others. Plus the event is being sponsored by 3M. Yes, the duct tape company. How cool is that? Can't make it? You can still participate. GLXP will be live-tweeting the event along with a number of other participants -- just follow the #spaceup hashtag on Twitter. A list of SpaceUp attendees is available on Twitter. Our friends at SpaceVidCast will also be live broadcasting a majority of the event. Join us virtually by signing into their chat room during broadcasts! Show schedule will be updated on their website, with the 1st broadcast taking place at approximately 12pm PST (2000 UTC). Yes, the planets and stars have aligned and will bring together the greatest competitive Moonpie eaters on the planet, or at least enough of them to generate a significant amount of smack-talk and a certainly hilarious YouTube video. If you haven't seen a Moonpie eating contest yet, well... it's kind of like the Olympics, but better. SpaceVidCast will broadcast the epic event on Sunday afternoon (Pacific time, exact time TBD), and I'll post an update here on The Launch Pad tomorrow. For those unfamiliar with the Moonpie tradition, here is a previous GLXP Moonpie competition video, and the official Fabio Rules for the competition. Don't forget to tune in this weekend, and see what this SpaceUp thing is all about. If you like the format, you can start one in your city as well!